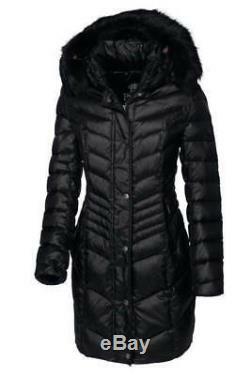 Pikeur Tamika Ladies Down Coat, black. The new Tamika down coat from the Pikeur Premium range is the perfect coat for keeping you warm this winter. With a sporty and elegant design, the outer fabric has a fashionable quilted design with shimmer. It features a RDS-down filling with 80% down and 20% feathers, for great heat insulation to keep you warm as the temperature drops. Sporty and elegant outer fabric with shimmer. Quilted outer fabric of hood. Hood fastening on front collar with hidden poppers, not visible. Detachable imitation fur on hood tone in tone with outer fabric. Hood lined with jacquard motif. Alcantara stripe on outside of hood. Decorative strass on alcantara stripe. Decorative zips on edge and pocket, 2-tone. Prime stud on garage, badge, zip toggle. Jacquard lining all over inside, outer material border with embroidered prime emblem. The item "Pikeur Tamika Down Coat black ladies long fitted padded quilted jacket 42 UK 14" is in sale since Wednesday, January 9, 2019. This item is in the category "Sporting Goods\Equestrian\Clothing & Accessories\Women's Clothing\Jackets". The seller is "highendequestrian1" and is located in Crewe. This item can be shipped worldwide.